The strong artistic tradition of northern Romania shows itself in many different ways: the glorious “painted” monasteries with their interior and exterior frescoes, intricate wood-carvings and richly embroidered national costume. 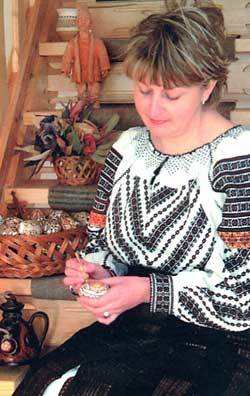 One of the crafts associated with the region - and with other areas of eastern Europe - is the decoration of eggshells with intricate designs. Many of the patterns are traditional, symbolic and have been handed down from mother to daughter for hundreds of years. We realised that this particular craft had several advantages. The decorated eggs were universally appealing, they were small and light, and although delicate, could be transported safely in the right packaging. They would therefore make ideal gifts. The women already possessed the necessary artistic skills and had centuries of tradition behind them. 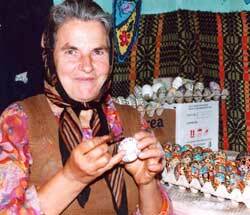 However, in their isolated villages, they had few opportunities to display and sell the eggs. 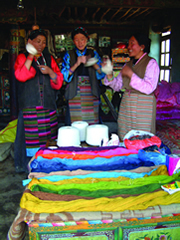 Working initially with eight village groups, Transrural and the egg decorators identified the problems and issues surrounding the making and marketing of the eggs. First of all, the women had difficulty in buying the raw materials. They bought duck and goose eggs from poultry farms but sometimes these were scarce and, individually, the women did not have much bargaining power. Paints and dyes were bought from just across the border in Ukraine but finding good lacquer was much more problematic. Sub-standard materials also led to problems with quality. For example a poor lacquer does not provide the right kind of high-gloss finish that makes an egg so attractive. Mothers, grandmothers and aunts were keen to teach the craft to younger women but couldn’t afford to buy extra materials just for training purposes. Some were keen to try new patterns, but access to design ideas was limited to a few who could afford to buy books. One of the most obvious issues was the safe transportation of the eggs, whether sold to individuals or in bulk for onward sale. And then there was the whole question of marketing. How were they going to sell the eggs, and to whom? We decided to tackle the issues on two fronts: production and marketing. On the production front, we set out to improve quality and provide training. We gave funds to the groups so that they could buy extra materials and hold training sessions: these attracted all ages, from primary school pupils to young women in their twenties. We researched new designs and funded books, for distribution among the villages. We found a shop that sold good quality German lacquer. We showed the groups how to buy in bulk to help reduce the cost of the eggshells. Thanks to the Moldova link, the women were able to buy - more cheaply than in Romania - from a Moldovan farmer who made the trip to the villages in his lorry every year. We also gave grants to those who wanted to experiment with different colours and designs. We stressed the importance of consistently good quality and showed examples of good practice to all the participants. On the marketing side, we tackled the packaging first. The eggs are delicate and customers could be deterred from buying by the fear of a breakage by the time they reached home. With the help of an egg packing company, we devised a transparent plastic cube in which the egg was not only held securely but also displayed. Thousands of eggs are now sold by post to customers and so far there is no record of a single breakage. There only remained the question of whom to sell to. 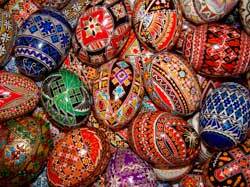 Locally, the egg decorators started to make more sales to visiting buyers from Hungary, Germany, Switzerland and The Netherlands. The improvement in quality was a big factor in this increase. Transrural also took eggs home and began to publicise them through articles in the press, Open Days on our office premises and at Fair Trade events. Sales grew and the surplus was put back into the project to continue support with training and development. At its height, 200 women participated. Some saw a substantial improvement in their standard of living. Paula Omania moved from a cramped apartment in Brodina to a new house and said: “My new home was built on eggshells!” Ana Rubanei and her family installed a proper bathroom to replace an insanitary outside lavatory. 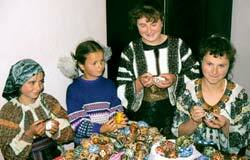 Others found themselves invited to prestigious craft events in Bucharest. The original village groups have dissolved. The members were too disparate to continue working together. But they are re-grouped into smaller units based on the extended family, an arrangement that fits better with their way of life. Transrural continues to help them sell their wonderful decorated eggs in the UK. Grant funding from the DFID Small Grants Fund via the British Embassy, Bucharest; Churches Together in Witney; Transrural sponsors.